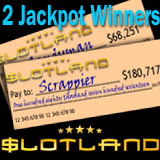 Popular slots and video poker site Slotland has had two major jackpot winners in the last few weeks. Since there’d just been a massive $180,000 jackpot win, last week’s $68K winner was hardly expecting Slotland’s progressive jackpot to pay out again so soon. First Alice M, known as SCRAPPIER at Slotland, won the progressive jackpot at $180,717. It was re-set to $50,000 and just a couple of weeks later, Alberto S. aka SANDYMAN hit it again winning $68,251. Alice had been playing the traditional fruitie, Fruitmania. Alberto won his jackpot playing one of Slotland’s very first games, Spacejack. Alice has been a regular player at Slotland, one of the most popular no download slots and video poker sites in the world, since 2009. Alberto said he’s looking forward to paying off some debt and to taking his family on a small trip. Slotland has been entertaining slots and video poker players around the world for more than thirteen years. It has 24 unique instant-play slots online that aren’t available at any other online casino. Six, however, are also available as mobile slots. Most slots games are tied to one progressive jackpot which was reset to $50,000 after Alberto’s win.